The Nam Tok Klong Plu is the most popular waterfall on Koh Chang in the Gulf of Thailand. 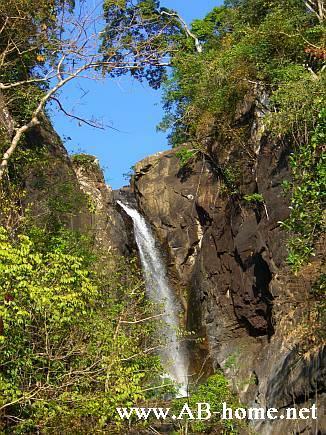 This waterfall is in Klong Prao on the west coast of the tropical island. You can ride on your motorbike till the national park office of the Mu Ko Chang. From there it’s a pleasant walk thru the tight jungle to the Klong Plu waterfall. The water falls down from about 25-30 meter in a natural pool where you can refresh yourself in cold clean water from the jungle on Koh Chang. On the National Park office you have to pay an admission fee of 200 Thai Baht. This was the price in December 2008, maybe the price rise from while to while. 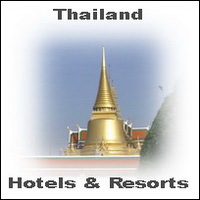 For actual information take a look in Your Lonely Planet Thailand travel guide. The walk to the Nahm Tok Klong Plu will take you about 15 minutes at long the Klong Plu River which ends in the Gulf of Thailand near Panviman Resort. The highest waterfall on the island is perfect for a half day trip; don’t forget a towel and a swimming pant if you want to go swimining in the fresh water of the jungle pool. The Klong Plu is one of the main sights on the tropical island in Thailand. Near the office of Mu Koh Chang there are some restaurants and souvenir shops where You can buy cold drinks, some Thai food and of course souvenirs. 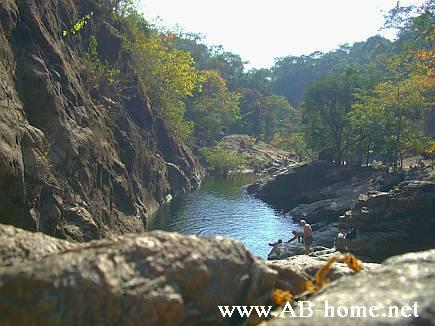 The picture shows the waterfall during dry season, there is much more water in the green season between April and October. Enjoy this nice part of the beautiful island Ko Chang in Thailand.